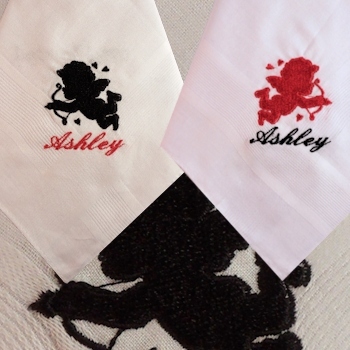 A pair of two cupid handkerchiefs personalised with a name or initials of your choice and featuring an adorable cupid silhouette with little love hearts embroidery. This sweetheart gift set has two cupid embroidered cotton hankies, and personalised with a name or initials on each hanky in your choice of thread colours. Our example picture is alternating red / black threads. Type in the name or initials you want personalised and choose the letter font style you prefer for the text.